President-elect Donald Trump's unrelenting attacks on the press have demoralized an industry already beset by financial uncertainty and widespread public disapproval. But Trump has also proven to be a galvanizing force and an economic boon for many left-of-center outlets, reminding some of the last time a Republican held the highest office. President George W. Bush and his administration were both foil and rallying point for liberal media, boosting traffic and revenue and helping give birth to a new generation of left-leaning journalists and outlets. Trump's election has provided a similar impetus for liberal newsrooms. But there may be more infighting this time around. Cenk Uygur has heard multiple people draw comparisons to the Bush years since Trump's stunning election in November. Uygur launched his progressive talk show, The Young Turks, in 2002. It was a year into Bush's first term, and a period that coincided with a flowering of liberal outlets. But Uygur accuses many of those same shops of losing their edge in the eight years of Barack Obama's presidency. "During the Bush years, we on the left were in the wilderness," Uygur said in a phone interview last week. "We had no infrastructure, we had no media, so we had to create a media out of whole cloth." "Then during the Obama years, the corporate Democrats who were around in the Clinton years become even more emboldened," he added. "The corporate Democrats have no interest in real journalists or fighting the status quo because they're very comfortable." Over the last year, as divisions between the moderate liberals and progressives deepened, The Young Turks became something of a beacon for Bernie Sanders supporters. Uygur even got a shoutout from the candidate himself on the campaign trail last year. The show originally aired on Sirius and later on Air America, the Bush-era radio network that shuttered in 2010. Today, the program boasts a large and loyal audience, with more than 3 million subscribers to its YouTube channel. That following has helped Uygur's team grow. The Young Turks raised $500,000 from its audience last month as part of an effort to fund an expanding investigative journalism unit, according to Uygur. As of Thursday, Uygur and company had raised $733,000, an impressive number although well short of their $2 million by Inauguration Day. The first half-million was used to bring in a pair of progressive activists as new hires: the radio host Nomiki Konst will serve as an investigative reporter, while Shaun King, who is also a columnist for the New York Daily News, will act as a news correspondent. Uygur said The Young Turks intends to cover Trump "super aggressively." "As aggressive as we can possibly do it," he said. "Trump's presidency is going to be a target-rich environment for acts of corruption." Josh Marshall, the founder of the liberal website Talking Points Memo, has similar ideas for the Trump presidency. Marshall launched TPM as a one-man blog during the Florida recount in 2000. The site has since evolved into a full-fledged independent news organization with offices in both New York and Washington, D.C.
TPM made its bones with muckraking coverage in the Bush years, eventually becoming the first digital-only outlet to win a George Polk Award. But the site veered away from investigative journalism during the eight years that Obama has been in office, instead devoting most of its editorial output to aggregation and Marshall's commentary. Now Marshall wants TPM to return to its heyday. He said he plans to hire a reporter in Washington to "aggressively pursue iterative, investigative journalism in the TPM tradition." TPM also intends to hire two additional writers and another editor in New York. "Trump wasn't the impetus," Marshall said in an email. "We already had plans to build out the edit team before the election. But Trump's election gave it more focus, made the need seem more pressing and made us rethink how ambitious we should be." Those hires will be funded in part by TPM readers who have signed up for the site's premium section, which costs either $50 a year or $4.99 a month. Marshall launched a new membership drive in July, setting a lofty goal of 20,000 signups by the end of the year. The site fell short, ending with just under 19,000, but Marshall said Trump's victory brought a surge of new members. From the day after Election Day through the end of November, TPM had 1,956 signups; by comparison, the site had 1,316 signups in October. "We assumed signups would slump after the election, just in the nature of things, with a drop off in focus," Marshall said. "But November was the biggest signup month of the year and basically our biggest sign up month ever." Mother Jones, the liberal, reader-supported magazine founded in 1976, has enjoyed a similar post-election bump. Editor-in-chief Clara Jeffery said the magazine raised $203,000 in one-time donations in November, a 1,591% increase over a typical month. November was also the magazine's strongest month in subscription sales, with 8,542 new subscribers. And, like TPM, Mother Jones is staffing up. Last week, Jeffery announced that reporter Andy Kroll, who left Mother Jones in 2015, is returning to the magazine to cover "crony capitalism." Jeffery said Trump's election was a "call to arms for investigative reporting, " an area that has traditionally been Mother Jones' bread-and-butter. "The media is, broadly speaking, still too susceptible to the kind of clickbait machine that Trump rides on," Jeffery said. "He really rode that to great effect." "The way that journalism has structured itself was already not working on multiple levels," she added, "but I think we saw someone exploit its soft spots incredibly adeptly." 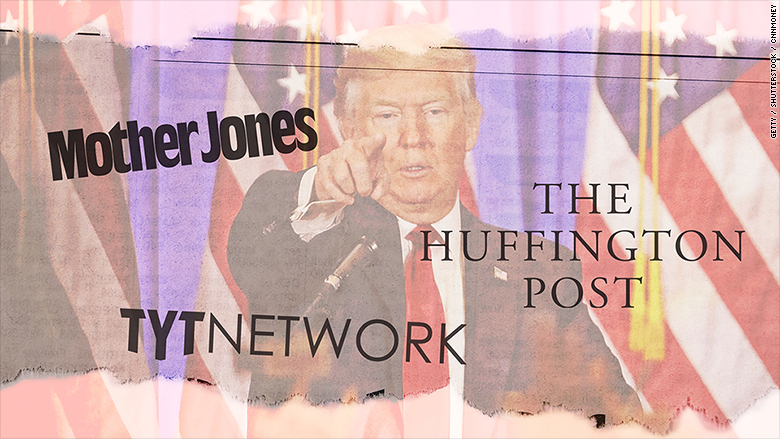 The Huffington Post doesn't rely on subscriptions, but the site may have drawn a different kind of windfall following Trump's win in November. "Our traffic after the election was several times larger than it would have been if Hillary Clinton had been elected," said Ryan Grim, the Huffington Post's Washington bureau chief. "We're certainly seeing a lot of interest." Founded in 2005, the Huffington Post became a must-read for the opposition during Bush's second term. But it became less associated with liberal politics during Obama's presidency, a result of its eponymous founder Arianna Huffington's increased focus on wellness and lifestyle matters. Huffington stepped down as editor-in-chief in August to focus on her new venture. In recent months, the site's leadership has signaled a desire to return to its roots. In a memo sent in September, Huffington Post CEO Jared Grusd described the site as "the world's premier progressive media platform," and urged staff members to sharpen their voice. Last month, Grusd tapped Lydia Polgreen, a widely respected journalist who spent almost 15 years at the New York Times, to serve as Huffington's replacement. Polgreen cited Trump's election as a factor in her taking the job, calling the Huffington Post a "truly great global, progressive news platform." Grim said he thinks the site is as populist as it is progressive. "So if Trump pushes this populist agenda," he said, "we're going to be there cheering him on." Grim, who joined the Huffington Post in 2009, also disputes any notion that the site dialed back its political coverage during the Obama years. "I think we became pretty oppositional to the White House in mid-2010 up until 2014," Grim said, pointing to the site's criticism of a stimulus package and austerity measures put forward by Obama. But Uygur said "a lot of the left-leaning media should be embarrassed of themselves" for the last eight years. And if the 2016 Democratic primary between Clinton and Sanders was any indication, the opposition may be less unified than it was when Bush was in office. "What's really disenchanting is that the progressive blogosphere and the progressive media completely let their guard down in the eight years of Obama," he said. "They should have been holding him accountable just as much." "It's not like they found their journalistic backbone," Uygur added. "They're back on offense now that the Democratic Party lost." Marshall, who found himself at odds with Sanders' progressive supporters during the primary, said he doesn't expect the divisions to disappear, but believes "they will be significantly subsumed under opposition to Trump." Uygur, for his part, said a more fractured opposition is positive -- to a point. "I mean, it's healthy until we win," he said. DISCLOSURE: The author worked for Marshall at Talking Points Memo from 2011 until 2014. Correction: This article originally stated that Shaun King had been a columnist for the New York Daily News; in fact, he remains a columnist there.